Date: Dec 8 2018, 1 p.m. 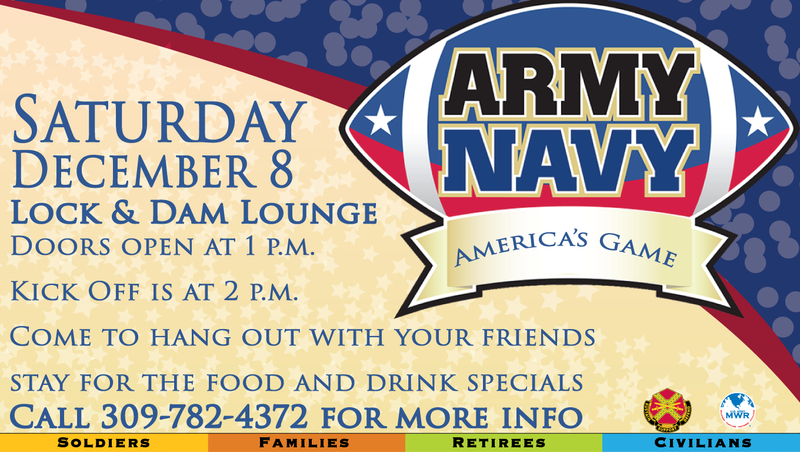 Whether you're cheering for the Army Black Knights or the Navy Midshipmen, get to the Lock & Dam Lounge to cheer your side to victory in this annual grudge match. Doors will open at 1 p.m. and kickoff is at 2 p.m. Enjoy food and drink specials including Arsenal Pale Ale and Lock & Dam Lager, both of which are only available at the Lock & Dam Lounge. This event is open to the public and you'll simply need to show a valid ID at the gate to access the Island. Call +1 (309) 782-4372 for more info.